"When CDs can do this, who needs another medium?" Sound "Utterly smooth, fatigue-free presentation that is nevertheless highly detailed -- perhaps more detailed than that of any piece of digital gear I've used. By comparison, it makes other transports sound mechanical, with trumped-up edge definition." "I've always maintained that the very best components combine great resolving power and great naturalness, and this is exactly what the Model 2000 Premium does." 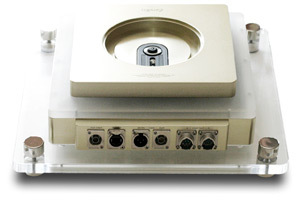 Features A two-piece CD transport which shows that Zanden Audio "has paid serious attention to both its mechanical construction and ability to pass along a data stream that's as unaffected by jitter as possible"; "the transport unit itself is a four-layer sandwich of clear acrylic, brushed aluminum, frosted acrylic, and more aluminum"; has a highly accurate word clock and includes an I2S output for use with the Zanden Audio Model 5000 Signature DAC. Use "In terms of which of the Model 2000 Premium's four digital outputs to use, if you have the Model 5000 Signature DAC, I2S is the only way to connect DAC and transport." Value "While the value of any component that approaches 30 large will come into question, the Model 2000 Premium isn't made for just anyone. Its well-off buyer will likely own an audio system whose value is several times the Model 2000 Premium's cost. The same will hold true for this person's house, cars, bank account and stock portfolio." How many CDs do you own? I have over 2000, and that number slowly increases even as I prune titles to which I no longer listen. I still own the very first CD I purchased, The Tango Project [Nonesuch 79030-2], and I listen to it every now and again, something I plan to do for as long as my laser is still able to able to read my bits. Given life-expectancy figures, I could easily own The Tango Project for over 50 years, and during that time I will play it well over 100 times. Multiply this by the many hundreds of CDs I have owned for years and plan to keep, and you have tens of thousands of hours of listening. Given all this, having CD-playback hardware that I love becomes a near necessity instead of a luxury, even with my admiration for SACD and my growing SACD collection. CD and SACD can live happily within the same music collection; in fact, they pretty much have to, as SACD titles are growing more and more rare and CDs continue to dominate. A few years ago, Zanden Audio's concentration on CD-only playback seemed a bit misguided at the very least. Today, with the company's Model 2000 Premium transport and Model 5000 Signature DAC representing an integrated assault on the title of best CD sound available, Zanden looks like it knew all along that SACD and DVD-A would stumble. I've used Zanden's Model 5000 Mk III DAC as a reference for a couple of years, so a follow-up review on the Signature version of the Model 5000, along with comments on the DAC and transport used together, is scheduled to appear in short order. However, in this review, I will address the Model 2000 Premium transport alone, which is the sort of coverage it deserves given its exalted price and sonics. Kazutoshi Yamada, the design mind behind Zanden Audio, is well known for making high-quality tubed audio electronics. His Model 1000 and 1200 phono stages have separate RIAA, Columbia and Decca equalization curves. The latter two compensate for Columbia and Decca LPs that weren't created with RIAA equalization, and they reveal that Mr. Yamada's tolerance for compromise is non-existent. His Model 5000 DAC, currently in its Signature iteration, uses out-of-production Philips TDA-1541A Double Crown DAC chips and a proprietary analog filter. Both simply sound best to Mr. Yamada. Devising such products is one thing, but creating them is quite another. Perfectionism has its requirements, time and expertise being chief among them. Zanden products are therefore made in very small quantities, often completely by Mr. Yamada himself, and, at least from my experience, have very few peers in the audio world. The $27,970 USD Model 2000 Premium transport follows the same sort of singular and extreme design method displayed in other Zanden products. It is a two-piece CD transport and shows that Mr. Yamada has paid serious attention to both its mechanical construction and ability to pass along a data stream that's as unaffected by jitter as possible. Physically, the transport unit itself is a four-layer sandwich of clear acrylic, brushed aluminum, frosted acrylic, and more aluminum in thicknesses up to 1". All of this material makes for an incredibly dense and sturdy chassis that measures 15 5/8"W x 15 5/8"D x 5 3/8"H, weighs 22 pounds, and undoubtedly keeps the deleterious effects of resonance and micro vibration to a minimum. Buried within it is a heavily modified Philips CDM12 Pro2 transport mechanism. This is similar to the mechanism that Audio Research uses for its CD3 Mk II CD player; when I used the CD3 Mk II and the Zanden transport at the same time, one remote control would work for both. Around back the Model 2000 Premium has standard S/PDIF RCA and BNC, AES/EBU, and I2S digital outs. It also has a word-clock output and a pair of power inlets for connection to the separate power supply, which measures 14"W x 15 1/4"D x 2 5/8"H and weighs 10 pounds. The I2S digital output and word-clock output signal a departure for the Model 2000 Premium. Both represent attempts at addressing the effects of jitter. With digital playback, the word clock's function is synchronizing digital samples such that timing errors -- jitter -- are lessened before the signal is converted to analog. A CD player's or DAC's word clock is where jitter takes its first steps toward becoming audible and affecting sound in detrimental ways. The Model 2000 Premium transport addresses this, first of all, by establishing a highly accurate word-clock signal in the transport, before it is sent to the DAC. Mr. Yamada tested a number of word clocks, including rubidium clocks from two different manufacturers. "Unacceptable tonality" was his terse assessment of these. After more comparisons, he settled on a double oven crystal oscillator, whose crystal is encased in an inner "oven" to control its temperature, and then this, along with temperature-control circuitry, is encased in a second oven. Crystal oscillators are affected by temperature, an issue that can be compensated for through additional circuitry or by controlling the temperature. The latter is how a double oven crystal oscillator works. The accuracy of the word clock used in the Model 2000 Premium, 2 x 10-10, is close to that of the rubidium clocks Mr. Yamada tested, but, more importantly, it made for better sound. "I judged the double oven crystal as the best of all for the Model 2000 Premium transport" is how Mr. Yamada states it. A Model 2000 Standard transport, whose word clock will have 2 x 10-8 accuracy, is in the plans but not currently available. Having an accurate word clock that's as free of jitter as possible is one matter. Getting the word clock's output to the DAC is another entirely. The transmission of the data stream is another place where jitter can be introduced. The I2S connectivity used for the Model 2000 Premium transport and Model 5000 Signature DAC is an advanced format that has been used in the past for products from Camelot, Muse and Sonic Frontiers. Its advantage is that instead of the word clock being embedded within the digital data sent along the S/PDIF or AES/EBU output-input scheme, it is carried on a separate pathway, so the DAC doesn't have to recover it from the data stream. Another advantage of the I2S format is a matter of addition by subtraction. When connected via I2S, the transport and DAC don't use S/PDIF or AES/EBU transmit and receive circuitry, which can also introduce jitter. 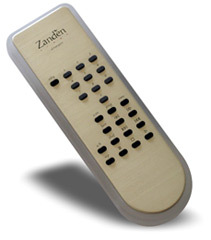 No Zanden product can currently use the Model 2000 Premium's separate word-clock output. I assume, however, that a future version of the Model 5000 DAC will have a separate word-clock input, although, once again, the I2S interface already carries the word clock separately from the digital data. A specially terminated I2S cable is included with the Model 2000 Premium. Because the Model 2000 Premium is a top-loading transport, you have the extra step of removing the lid whenever you insert or remove a CD. However, Mr. Yamada has designed the lid, which rests snugly in a recessed area on top of the transport, to incorporate the disc clamp necessary for the Philips transport mechanism. With the Audio Research CD3 Mk II, for instance, you have to open a sliding door, remove the clamp, insert the CD, replace the clamp, and then close the door. With the Model 2000 Premium, you simply remove the lid, insert the CD, and replace the lid. All technical details and design considerations aside, the Model 2000 Premium is one great-looking piece of audio equipment. For those of you art history majors, the transport chassis resembles a step pyramid, and the power supply, which could have been a plain black box, is dolled up with a brilliant chrome finish. Even the remote control is finely wrought and matches the transport perfectly. In addition to his ability designing audio circuits, Mr. Yamada also designs the look and chassis of his products, and does so with an artist's eye. Very few audio products look as dazzling as those from Zanden, and the Model 2000 Premium is at the top of the company's line in terms of sheer physical beauty. 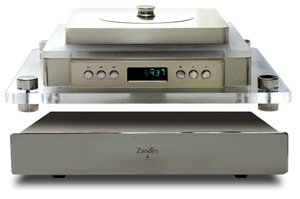 The Zanden Model 2000 Premium took its place in my system connected to either a Zanden Model 5000 Mk III or Model 5000 Signature DAC, a combo that played CDs alongside two top-flight integrated digital sources: an Esoteric X-01 CD/SACD player and Audio Research CD3 Mk II. To stiffen the competition, I listened to both of these players via their balanced outputs, through which they sound their very best. I will reiterate a point I made in my review of the ARC CD3 Mk II: You have not surveyed the best sound that digital has to offer until you've heard a fully balanced player like the CD3 Mk II or X-01 through its balanced outputs. Amplifiers were Lamm ML2.1 SET and M1.2 Reference hybrid monoblocks, along with a Blue Circle BC202 hybrid stereo amp. Preamps were a Mark Levinson No.32 and VTL TL-7.5, both of which allow for level matching of sources, which evens the output of each and makes for easier and more accurate comparisons. This feature is especially handy if you are comparing single-ended and balanced sources, which can have great differences in output levels. Speakers were Wilson Audio MAXX 2s, another piece of important test equipment because of their truly full-range sound. Interconnects and speaker cables were from Shunyata Research (Antares and Orion), AudioQuest (Sky and Volcano) or Siltech (SQ-110 Classic Mk II and LS-188 Classic Mk II). All power cords were from Shunyata Research (Anaconda Vx and Alpha, older Taipan and Python), as was the Hydra Model-8 used for power conditioning. The Model 2000 Premium is a very solid CD transport, and it's obvious that Mr. Yamada put some thought into the sonic effects of resonance control and damping. Just the same, I found that placing the transport and power supply on separate Harmonic Resolution Systems M3 platforms improved the Model 2000 Premium's performance a meaningful smidgen. In particular, voices had greater texture, and image focus improved. If you own a Model 2000 Premium, give the HRS platforms a try. They're expensive, but so is your transport. In terms of which of the Model 2000 Premium's four digital outputs to use, if you have the Model 5000 Signature DAC, I2S is the only way to connect DAC and transport. The Model 2000 Premium easily sounded its best this way, and it will perform at its best technically as well. Beyond that, I enjoyed S/PDIF BNC more than RCA or AES/EBU, especially when using Siltech's Signature G6 Golden Eagle, which is the best digital cable I've heard by a considerable margin. Even so, I2S is more dynamic and transparent. As mentioned, no piece of Zanden equipment can currently make use of the Model 2000 Premium's separate word-clock output. However, the Esoteric X-01 will accept input of an external word clock, and it locked without a hiccup on the output of the Model 2000 Premium. The Model 2000 Premium's word clock is strictly for non-upsampled CD playback, so the X-01 locks at 16-bits/44.1kHz and its upsampling is overridden. When connected to the Model 2000 Premium and playing CDs, the X-01 takes on some of the sonic characteristics of the transport, which indicates to me that the word clock used in the Model 2000 Premium is certainly an effective and important part of its design. However, with SACDs, the story was different, as the X-01 lost much of what differentiates its playback of CDs and SACDs: the ability to hear into each recording. I used the Model 2000 Premium's word-clock output off and on while listening to CDs with the X-01, but I didn't use it at all use when listening to SACDs. What makes one CD transport sound better than another? After all, what each is doing is simply reading data and sending them along. The digital-to-analog conversion is handled by a completely separate unit. That CD transports sound different is not a matter of debate; however, why they sound different, and whether those differences are actually improvements, is worth considering, especially as you begin shopping for a transport like the Model 2000 Premium, whose cost is greater than that of CD and multi-format players from Audio Research and Esoteric combined. But then, the Model 2000 Premium causes such speculation -- its sound is astonishing. "Silky precision" is how I state it in my listening notes; the Model 2000 Premium has an utterly smooth, fatigue-free presentation that is nevertheless highly detailed -- perhaps more detailed than that of any piece of digital gear I've used. By comparison, it makes other transports sound mechanical, with trumped-up edge definition. Such a presentation may appear to be more detailed, like a TV with its brightness and contrast turned up, but the Model 2000 Premium dispels this notion from the first few moments of the first CD. I've always maintained that the very best components combine great resolving power and great naturalness, and this is exactly what the Model 2000 Premium does. I greedily listened to a large cross-section of my CD collection with the Model 2000 Premium -- as though it were playing music in some kind of wonderful new format. Each CD sounded fresh, completely devoid of the bugaboos that have plagued digital sound in one way or another from its beginnings. In most ways, Zanden's Model 5000 DAC has always achieved this, but it has reached its pinnacle with the DAC receiving data from the Model 2000 Premium. A recent CD that came to me from a friend whose musical tastes I trust without qualification is by vocal group Chanticleer, How Sweet the Sound [Warner R2 60309]. I've described this CD to a few people as "gospel with a touch of attitude," an assessment that's born out by the first track, "Jesus Hits Like an Atom Bomb." This track earns its grandiose title -- it swings hard. I have played it many times since I received the CD, and on numerous digital components, but none has reproduced the space around the singers with such a material nature as the Model 2000 Premium. On my recent trip to Montreal to cover Son & Image 2005, I played this track at least a dozen times; after returning, I played it on the Zanden transport again, and the sound nearly elicited a contented "Ahhh," so gracefully resolved were the voices and the entire soundscape. But the Model 2000 Premium isn't just about grace; it can convey raucous power just as ably, though without the synthetic crispiness that some digital gear conveys, especially on electric guitar. Another track I played at Son & Image, although only once, is "Universal Heart-Beat" from Juliana Hatfield's Only Everything [Atlantic/Mammoth 92540-2]. The profound message of this song, revealed in the chorus, "A heart that hurts / Is a heart that works," is set amidst some loud, distorted, grungy guitar. The Model 2000 Premium conveys all of the rowdiness and never loses grip on Hatfield's girlish voice, even as she seems to turn her amp up to 11. Bass doesn't have the ultimate sense of control and tautness, but as with the rest of the musical spectrum, it simply sounds right -- not uptight or bloated. Christian McBride's playing on "Red Cross," from Parker's Mood [Verve 314 527 907-2] by the Roy Hargrove / Christian McBride / Stephen Scott Trio, starts and stops, rumbles and purrs, in perfect harmony and proportion. This cut is a two-minute bass solo, and it will tell you all you need to know about any component's low-end prowess, provided that your amps and especially your speakers are up to the challenge. I can't call the Model 2000 Premium's bass a strong point of its performance, but I can say that it is ideally integrated into the music and doesn't redirect your attention. In this sense, it's what I want from high-end audio, especially considering that the Wilson Audio MAXX 2 speakers I'm using will convey whatever low frequencies are sent to them -- including uncontrolled, poorly integrated ones. Lesser speakers function as bass filters to some extent because they simply can't go as low or with the same authority as the MAXX 2s, especially horn-loaded and single-driver designs. There is openness and ease to the Model 2000 Premium's sound. It offers a clear picture into each recording, but it's not insistent, as though it has to lead you to experience music in one particular way. Its sound is as approachable as an old friend. There are no preconceived notions about how the music should sound; it simply is what it is. I know I'm venturing into audio philosophy here, so let me give an example. The RVG remaster of Eric Dolphy's Out to Lunch [Blue Note 7243 4 98793 2 4] displays the sonic characteristics of all the RVG recordings I've heard: it was remastered at a noticeably higher level, and there is a sharpness to its presentation that begs you to turn the volume down even further than you already might. Out to Lunch is a great, important jazz album, one that I've heard on vinyl, standard CD and now as a remaster. The particular disc doesn't matter when you hear this recording on the Model 2000 Premium. The recording's intrinsic sound doesn't change, but its characteristics are overshadowed by the invention and flow of the music. The Model 2000 Premium asks little of the listener, which helps suspend disbelief but also makes for completely relaxing listening. Thinking, theorizing and analyzing become the impediments to a fulfilling experience, not the fact that the music isn't live. In this way, the experience of listening to the real thing is achieved, even if the music is recorded and reproduced. The Model 2000 Premium makes me apathetic about the format I am listening to. I have an Esoteric X-01 here, and when playing a choice SACD, its sound displays much of what I say about the Model 2000 Premium, although in distinctly different proportions. Even so, I found myself over time listening to more and more CDs, and then one day I realized that SACD had become an afterthought. "How did that happen?" I wondered. As strange as it may sound, I speculated then that there is something human about the Model 2000 Premium's performance, something that connects with listeners on a level below consciousness. In the past, when I've encountered pieces of equipment that pushed me ever closer to the sound of live music, there has been instant recognition that a step forward has been taken. I experienced this with the Model 2000 Premium as well, but it was followed by CD becoming, through no effort on my part, my default for listening, even with a top-flight SACD player connected and ready to please. I ask again, "How did that happen?" For the past few years I have used a Mark Levinson No.37 transport ($4500 when available) as my reference. Last month, I reviewed the Audio Research CD3 Mk II ($5495), a CD player that also makes a terrific CD transport. Both the No.37 and CD3 Mk II have S/PDIF BNC outputs, as does the Model 2000 Premium. So I compared the No.37, the CD3 Mk II and Model 2000 Premium via their BNC outputs and with the Model 2000 Premium connected to the Model 5000 Signature DAC with the included I2S cable. Over time, other transports have shown the No.37 to be less than perfect in some ways, but its high resolution has always helped me hear what's happening on each recording as well as with other components downstream. As a transport, the CD3 Mk II has a less uptight, more relaxed character, and I prefer it to the No.37. Ahead of the CD3 Mk II on this same road is the Zanden Model 2000 Premium, but with a twist: it equals or betters the No.37 in terms of absolute resolution and it does so in a less ostentatious, more polished way. Back to Parker's Mood and "Laird Baird," a duet between Christian McBride on bass and Stephen Scott on piano. The No.37 emphasizes the attack of the piano's notes, making some of them sound forced and aggressive. The CD3 Mk II lessens this a bit, and puts the piano on a plane slightly in front of the speakers, with the bass back a step. With the Model 2000 Premium, concern over these sorts of issues melts away. These things are discernible (the piano and bass are on nearly the same lateral plane, with the piano slightly in front), but analysis of the position of the instruments, the attack and decay of each note, and the tonal character of each instrument are outweighed by the easy resolution of the music and the rightness of its proportions. Yes, I know -- you think I'm half (or fully) off my rocker. But this is what the Model 2000 Premium does. You can scrutinize and hypothesize, but you'll be wasting time you could be hearing your CDs reproduced with consummate musical realism. None of these three transports is bad -- quite the opposite in fact. It's just that there's no question as to which one of the three sounds best. Unfortunately, it also happens to be the most expensive. While the value of any component that approaches 30 large will come into question, the Model 2000 Premium isn't made for just anyone. Its well-off buyer will likely own an audio system whose value is several times the Model 2000 Premium's cost. The same will hold true for this person's house, cars, bank account and stock portfolio. For selfish reasons, I wish the Model 2000 Premium cost less than $2000. For musical reasons, I'm simply happy that it exists. A decade ago, CD transports were all the rage. Audiophiles seeking the best possible sound from their CDs were investing in outboard DACs that promised sonic improvements -- and delivered. CD collections began to bulge, and the audio industry flourished as so many listeners wanted a better listening experience -- and got it. But then digital playback got complicated. High-resolution formats, which promised even better performance than CD, muddied the digital stream, and the sales of digital separates have diminished. A decade earlier practically every electronics manufacturer had top-flight digital components in its product lineup. Now such products are few and far between, even as audiophiles' CD collections continue to grow. While I will never play every one of my 2000+ CDs on the Zanden Model 2000 Premium transport, I can't think of a better component for wresting the music from their pits. The ease and resolution of the Model 2000 Premium work together to produce music in all its meaning and glory. The CDs I played sounded both more honest and elegant, as individual sonic details took on a sense of greater intrinsic character and more lifelike splendor. So much of what is responsible for this is obscured by the Model 2000 Premium's gleaming chassis, but you should keep in mind the super-accurate word clock and I2S digital output. Both prove that Kazutoshi Yamada is a forward-thinking audio designer who embraces technology if it serves music. The technology integral to the Model 2000 Premium's design goes a long way toward producing the transport's unmatched sound. I made sure to hear The Tango Project on the Model 2000 Premium, and it never sounded better. The success of this music relies on the piano, violin and accordion melding into a rhythmic whole, which they did via the Zanden transport, but this was accompanied by a sense of hearing this recording in its purest form. The inherent steeliness was still present, but this was paired with a languid creaminess, especially from the violin, that seemed to draw out each note further than ever before. I played "El Esquinazo" and "Jalousie," a pair of cuts that have been burned into my memory, a few times each, just to revel in the Model 2000 Premium's performance. When CDs can do this, who needs another medium? Yamada-san asked me to acknowledge your excellent review of the Zanden 2000 Premium. Thanks for the opportunity to respond. Frankly, you appear to have pretty much covered all the bases. One comment struck me especially. You picked up on the combination of smoothness and inner detail without resorting to a kind of edgy presentation to "juice up" the impression of detail. I recently had a visitor here who, after listening for a while, actually wondered whether the presentation was "too smooth!" He had no questions about the musical detail, only that the characteristic digital edge was missing. He probably left a bit unsettled. Personally, I enjoyed the dilemma it presented. "High resolution digital" and "too smooth" in the same sentence -- who could have dreamed that was even possible? Ive always thought this design aspect was most like a high-wire balancing act. What is "resolution" for some is "too mechanical" for others, and vice versa. So the designer needs to have supreme confidence that his personal version of music reproduction is the best choice. And at these price levels (necessitated from Zandens uncompromising finish levels and the exotic parts on board), the stakes are exceedingly high. Therefore I admire Yamada-san almost as much for his courage of conviction as I do for his visual and sonic design triumphs. Yamada-sans efforts have given Red Book CDs new life. Some of my long-term personal clients have "over-the-top" analog rigs. Theyve found the combination of the Zandens alluring musicality and the practical convenience of CD to have swung them into almost exclusively using the Zanden as their source. I can hardly believe it myself, because they were such hard-core analog guys. Finally, we are eager to read your findings regarding the 5000 Signature DAC clock-linked with the 2000 Premium in the system configuration for which they were ultimately designed.